Yay! Myself and my fellow weardrobe conference goers have been featured on the Modcloth blog Modlife! Apart from the amazing lighter-than-air dresses,the smoke bubbles at Galliano's show blew.my.mind. I love this preppy-quirky look you have going on here. And I love accessories for that very reason! I've been seeking thigh high boots for ages as well, those are fantastic. Also, love your quirky-cute outfit here. Girl, you always have the best shoes! I am in awe. wow, amazing pictures. i like your little bag. so sweet. i miss my school days..
i love everything about this outfit! so much. those boots are ridiculously awesome... good luck saving up for them! You have such elegant style- the outfit looks great. I don't know how many people manage to look that pulled together at school. I have such a hard time buying boots because I have awesome calf muscles (lol) and therefore a lot of boots don't fit. Sad. Also I'm a big fan of buying shoes online but that means I can't try them on and see if they actually fit. I can't find any actual stores that sell thigh highs. sad times. You will rock those boots though, I just know it! I especially love the Rodarte-ness of them. uh-mazing. WOW! I love your style! Why haven't I come across your blog sooner! Following! omg the boots are perfection! News on daily-women, the blog of two french fashionistas :) come on and see us. see ya. love your outfit and those boots are amazing! those boots are SOOO amazing... and i'm in love with those sneaker wedges..
Hey I just recently started following your blog after coming across it on seventeen.com. You inspired me to start my own! 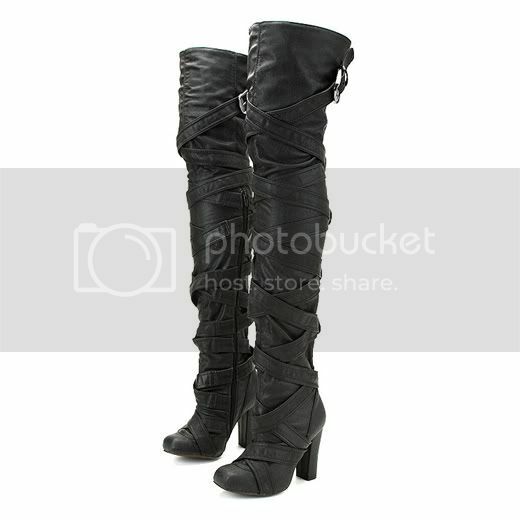 (www.chanelinthesnow.blogspot.com ) I too have been on the trechoreous hunt for over the knee boots! I finally found a pair at Aldo, and they were only $100! I am in love with them! I have pictures on my blog. Love your blog! YOU HAVE AN AMAZING BLOG. I NOMINATED YOU FOR A BLOG AWARD. CHECK IT OUT ON MY BLOG. Wow! I love your school girl outfit and your shoes are absolutely gorgeous. Your home made studio is so cool. I’ve always wanted to have like this one. I really like the outfits. i truly adore your own posting choice, very remarkable. last few days our group held a similar discussion about this subject and you show something we haven't covered yet, thanks.